Gokyo Valley in the Himalayas of Nepal, which is one of the most attractive places within Everest Region that have got lots of unique features along with mesmerizing snow capped mountains. This is the beautiful and small village of Sulukhumbu district. This village is located at the elevation of 4,750 meters which makes this village a highest settlement place of Nepal and in the world too. The world highest hill is located in this unique valley. The village lies west of the Khumbu region and at the foot of Gokyo RI. 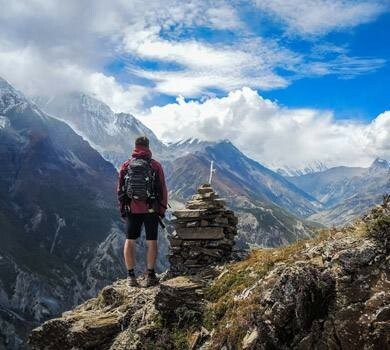 One of the major attractive destinations with the views of mountains and lakes make the trails to the Everest region more exciting and interesting. The village contains of abundant pastures for yaks during summer season and the beautiful lakes are breathtaking. Gokyo valley contains of two high passes, they are - Cho La pass one of the most adventurous trekking passes that has been travelled mostly. This pass is connected with Khumbu valley near Lobuche. The second one is Renjo La pass is a pass in Khumbu region with an elevation of 5360m that joins the trail between Thame and Nanga La pass. 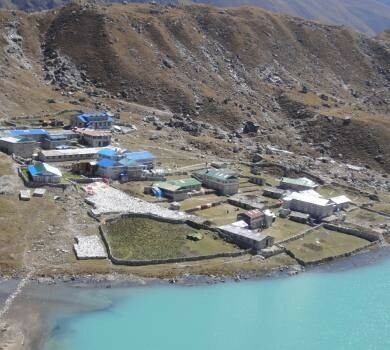 Gokyo Valley Trekking is the most popular trekking destination of the Everest region with unique landscape, panoramic views of mountains and the lakes of this place. The various kinds of flora and fauna that exist on the way to Gokyo valley or at Gokyo valley is so adorable and eye catching. The forests with national flower - Rhododendron along with the waterfalls which are often frozen and with the wide range of view to the surrounding makes ones fell in love with the place. Cho Oyu one of the highest mountains of Nepal (8,153m) can be seen from this valley and the lakes with crystal clear water of Dudh Pokhari (Gokyo Cho) and Gokyo Lake makes the place so unique. Along with the natural beauty, the place is habitat for Sherpas. The community of Sherpas people has got their own culture and tradition with them for which the outsiders getting to this valley can explore and understand the life style of these local residents. This is also one of the interesting things that one can get when exploring to this valley. Massif Holidays is the team of well experienced people and is working on this field from a decade who organizes the treks and tours in several places including GOKYO VALLEY. Feel comfortable to Contact US.